Opbrid Bůsbaar® Overhead Automatic Electric Charging Station for Heavy Duty Buses and Trucks. 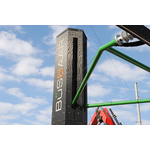 The Furrer+Frey/Opbrid Bůsbaar® is an overhead automatic electric charging station for heavy duty buses and trucks. It has a low cost and low weight fixed in-line current collector on the vehicle and automatically lowering pantograph contacts on the curbside gantry. We also offer a complete automated overhead charging system for nighttime charging at bus and truck depots. - Bus and truck OEMs who need an automatic charging system for their vehicle. - Bus operators looking for an automated electric charging system for their fleet. - Municipalities needing a standards based automated charging station for buses, delivery trucks, refuse vehicles and sweepers. - Researchers and project developers for new electric vehicle applications.